A rotator cuff is a group of muscles and tendons that cover the top of the upper arm bone and keep the arm in place while allowing arm movements in different directions. Oftentimes, due to the stress that is constantly placed on the shoulder, the rotator cuff gets overused and loses its strength and its ability to keep the shoulder stable. As a result, painful tears and swelling in the tendons of the rotator cuff occur, leading to weakness and tenderness in the shoulder and inability to move the arm. A year ago, John McGee visited Manhattan Orthopedic Care because of a severe rotator cuff tear in his shoulder. His appointment with Dr. Armin Tehrany revealed a significant tear of one of the tendons. At the time, John wasn’t able to freely move his arm and he struggled with an unpleasant soreness and tiresome pain while trying to do anything. During the appointment, it was absolutely clear that the rotator cuff surgery was the most suitable treatment solution for John’s shoulder. Before scheduling the surgery, Dr. Tehrany had a quiet talk with John, explaining every step and detail of the rotator cuff repair procedure, helping John to fully understand the entire surgical process. 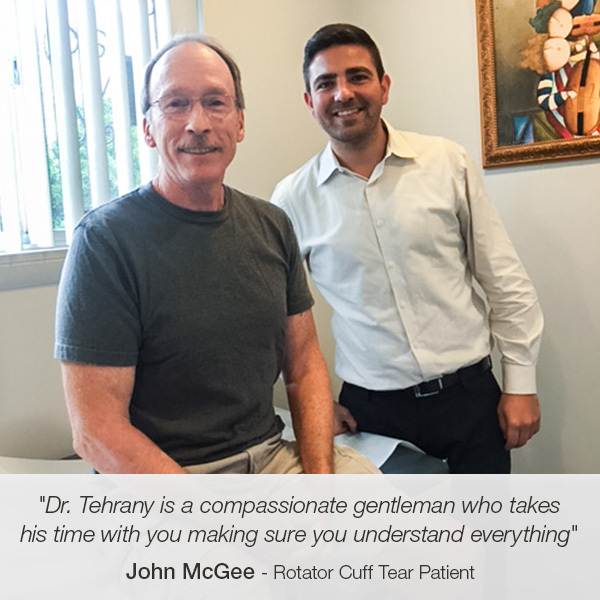 With a team of orthopedic professionals fully committed to providing superb orthopedic care, Dr. Tehrany successfully performed the rotator cuff repair, enabling John to enjoy a pain-free life once again. “I had a significant rotator cuff tear that Dr. Tehrany repaired back in December. The surgery was amazing. I experienced very little pain, and after 6 months I have a full range of motion. Just need to continue to rebuild strength. Because I was progressing so well, I told my physical therapist that he was a miracle worker. He responded: “No, no, you had a terrific surgeon that made my job easier”. Dr. Tehrany is a compassionate gentleman who takes his time with you making sure you understand everything about your condition. His practice is very impressive, very professional, efficient and friendly. His entire staff including his assistant, Dr. Stephan Bouskila, reflect Dr. Tehrany’s obvious commitment to excellence and compassion toward his patients.